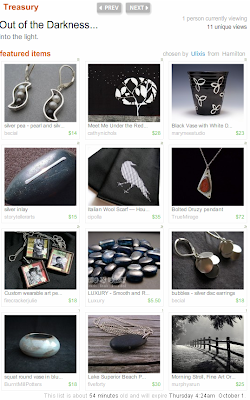 I just made a treasury!!! It was sooooo much fun!! I decided on a theme and chose a whole bunch. Then waited and waited. Then I sorted them into exactly how I wanted them placed, as well as the alternates. Then waited and waited. You have to wait for the number of treasuries to drop below 222... this can take a long time, and there's a good chance you'll miss it. So many people sign up at once so that there is often way more than 222... and so you wait. Out of the darkness... into the light. Congrats on your first treasury! I remember the first time I got mine....you're heart racing once you realized that it's yours! all yours! mwah ha ah...hee hee.